In JULIE TABOULIE’S LEBANESE KITCHEN, chef and Lebanese-American Julie Taboulie celebrates the colorful and flavorful cuisine of Lebanon, and shares an authentic array of original recipes that have been handed down in her family for over three generations. 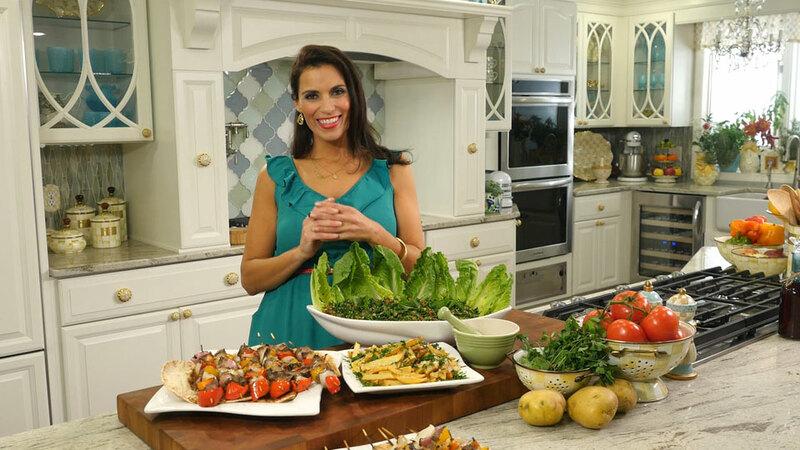 In the premiere of the Lebanese-flavored cooking series, host Julie Taboulie visits Mama’s Glorious Garden; and shares recipes that feature ingredients sourced from it. Also: green-thumb gardening tips. Julie Taboulie recalls the dishes of her youth; and makes taboulie, a tart, tangy and tasty salad. She also visits her mother’s garden; discusses how she got her stage name; and shows how she makes lamb kabobs, lahem mishwee, and Lebanese-style French fries, batata maqlieh. A visit to a farmers market affords Julie the opportunity to acquire the ingredients for makbouseh, a Lebanese-style squash stew. She also prepares Lebanese pasta in a garlic sauce; and fried squash blossoms. Recipes include batenjen mishwee, a fire-roasted eggplant spread; eggplants stuffed with meat and pine nut, sheikh el’ mahshi; and bayd b batenjen baked eggs and eggplants. How to make shawarma lahem, a street-food sandwich that features marinated lamb meat, caramelized onions and stewed tomatoes wrapped in warm pita bread. Rose water-infused sweets are featured. Included: bellawriyeh, a shredded phyllo dough dessert layered with a pistachio-walnut filling; and eish al bolbol, shredded phyllo dough sweets topped with pistachios. Julie and her mother make manoush bi zaatar, dough pies topped with the Lebanese spice blend called zaatar. Also: homemade yogurt; and ahwa, authentic Arabic coffee. Julie prepares mezze, a selection of small dishes. Included: hummus; baba ghanouj; and mouhamarah, which is a smoky roasted red pepper and walnut spread. Recipes include a peasant-style bread salad; fatteh hummus; and pita chips. How to make samak harrah, a spicy fish dishes. It’s paired with rez b macaroune, a long grain rice, and sleek b zeit, an orzo pasta pilaf with sautéed arugula and onion leeks. How to make xaruff mishwee, a crown roasted leg of lamb that’s infused with a bouquet of fresh herbs; freekah, fire-roasted baby wheat grains; and steamed spring vegetables tossed in a garlic and fresh-herb butter sauce called khoudra b samneh. Kibbeh, the national dish of Lebanon, is prepared in three different ways. Included: kibbeh nayeh, a Lebanese-style steak tartare delicacy; kibbeh kbekib, a meat pie; and kibbeh batata, a vegetable spread. The Season 1 finale features seasonal sweets, including baklawa, a phyllo dough and walnut diamond-cut dessert; homemade phyllo dough cups called baklawa b ashta; and knefeh.